Charlie has loved Soccer since he could walk. As it involves 2 of his favorite things. Which is kicking and balls. So when he was 3 we signed Charlie up to play Soccer and he loved it. And was wonderful at it. And enjoyed it so much. That I knew as soon as this new promotion from US Family Guide Challenger Sports – British Soccer Camps came through my email. That I needed to sign Charlie up. As it would be perfect for Charlie. And allow him to get out with other children and to be able to play his favorite Sport. So if your children are like Charlie and eat, breathe and sleep Soccer then I hope you will come and sign Charlie up for US Family Guide Challenger Sports – British Soccer Camps. And I think your children will enjoy it just as much as I did. And let me tell you a little secret if they accepted adults I would sign up just so I can keep up with Charlie. British Soccer Camp is the most popular camp in North America – 150,000 campers! With an innovative curriculum that develops skills, speed and confidence in players ages 3-18, British Soccer Camps provide boys and girls with the rare opportunity to receive high-level soccer coaching from a team of international expert’s right in the heart of their own community. In addition to teaching new skills and improving game performance, each British Soccer Camp provides lessons in character development, cultural education and is the most fun your child can have learning the sport they love! Now I would like to let you know if your Homeschooling your children like I am Charlie. 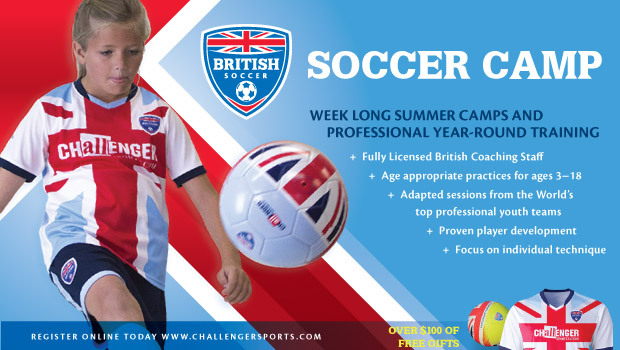 This new promotion from US Family Guide Challenger Sports – British Soccer Camps would make a nice addition to our Homeschool PE Class as it could be there PE for the week. And I know Charlie would enjoy it a lot more than what I have been teaching him. And your children may feel the same way. So my question to you is would you use something like Challenger Sports – British Soccer Camps for your childrens PE classes? Or have you used them in the past and if so what did you think of them? And then if you have something else you use what is it and if it is in DFW leave me a link to it so I can check it out as I am looking for something new for Charlie to take next year for his PE classes. Now here is my thoughts about the classes after Charlie attended and let me tell you Charlie loved them. And it is all he talked about for weeks. And I would love having him attend them all the time. As he learned so much. And the Staff was wonderful and they was able to teach Charlie so much and to keep him interested in what he was learning. And since he has take the class his Soccer has improved over 100%. And I am so happy and Blessed that I was able to have Charlie attend the class and I can never thank US Family Guide Challenger Sports – British Soccer Camps enough for there kind and generous offer. And I hope to be able to sign Charlie up for the class again if they host it in the Future.